Comments: Firstly I would like to say a big thank you to the author of the new tsoutliers package which implements Chen and Liu's time series outlier detection which was published in the Journal of the American Statistical Association in 1993 in Open Source software $R$. What is even more great is that this package implements auto.arima from forecast package so detecting outliers is seamless. 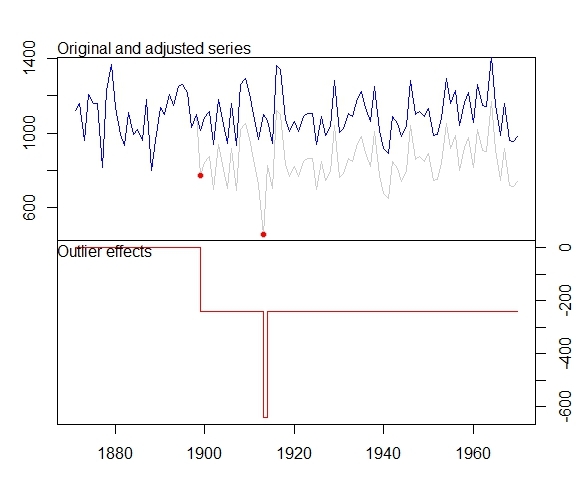 Also the package produces nice plots for better understanding of the time series data. I tried running few examples using this package and it worked great. Additive outliers and level shift are intuitive. However, I had 2 questions with regards to handing Temporary Change outlier and Innovational outliers which I'm unable to understand. The program rightly detects a level shift and a temporary change at the following location. Below is the plot and my questions. where $\delta$ is 0.7. I'm just strugling to translate this to the example above. across an innovational outlier in practice. any numercial example or a case example would be very helpful. 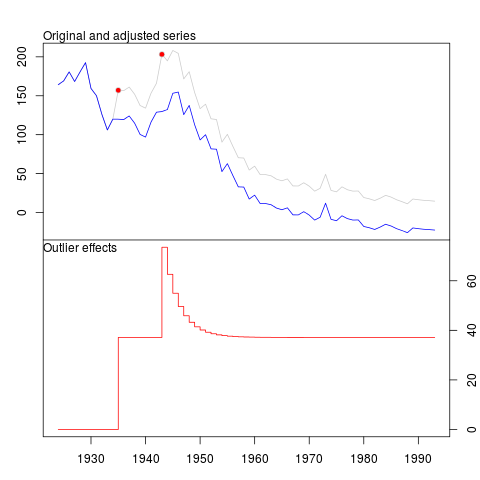 After applying tsoutliers function, it identifies an LS outlier and additive outlier and recommends an ARIMA order (0,0,0). The temporary change, TC, is a general type of outlier. The equation given in the documentation of the package and that you wrote is the equation that describes the dynamics of this type of outlier. You can generate it by means of the function filter as shown below. It is illuminating to display it for several values of delta. 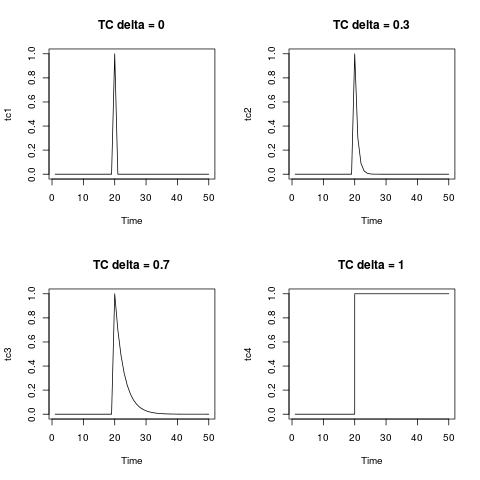 For $\delta=0$ the TC collapses in an additive outlier; on the other extreme, $\delta=1$, the TC is like a level shift. The innovational outlier, IO, is more peculiar. Contrary to the other types of outliers considered in tsoutliers, the effect of the IO depends on the selected model and on the parameter estimates. This fact can be troublesome in series with many outliers. In the first iterations of the algorithm (where the effect of some of the outliers may not have been detected and adjusted) the quality of the estimates of the ARIMA model may not be good enough as to accurately define the IO. Moreover, as the algorithm makes progress a new ARIMA model may be selected. Thus, it is possible to detect an IO at a preliminary stage with an ARIMA model but eventually its dynamic is defined by another ARIMA model chosen in the last stage. In this document it is shown that, in some circumstances, the influence of an IO may increase as the date of its occurrence becomes more distant into the past, which is something hard to interpret or assume. The IO has an interesting potential since it may capture seasonal outliers. The other types of outliers considered in tsoutlierscannot capture seasonal patterns. Nevertheless, in some cases it may be better to search for a possible seasonal level shifts, SLS, instead of IO (as shown in the document mentioned before). The IO has an appealing interpretation. It is sometimes understood as an additive outlier that affects the disturbance term and then propagates in the series according to the dynamic of the ARIMA model. In this sense, the IO is like an additive outlier, both of them affect a single observation but the IO is an impulse in the disturbance term while the AO is an impulse added directly to the values generated by the ARIMA model or the data generating process. Whether outliers affect the innovations or are outside the disturbance term may be a matter of discussion. In the previous reference you may find some examples of real data where IO are detected. Not the answer you're looking for? Browse other questions tagged time-series forecasting arima outliers or ask your own question. What algorithm should I use to detect anomalies on time-series? How to detect abnormality in an otherwise very systematic and regular time-series data for temperature measurement? What are some useful robust and scalable approaches towards anomaly detection of a time series data? Multiple ARIMA models fit data well. How to determine order? Correct approach? How to detect a relatively small level shift(leakage) in an hourly water flux time series in an area? How to adjust for a temporary 12-month level shift in time series?